A little update on my struggle with Wiki bugs. I got annoyed enough by the fact that I couldn't complete the translation work properly, so I've hacked together a small command-line editor that utilizes Wiki API and allows me to edit any articles without hitting neither "can't edit articles with non-latin characters in the page name", nor "can't edit external links via mobile view" issues. Print help for given command. If no command given, print this help. Successfully logged in as Dot_sent. I'd be happy to hear comments and suggestions. This sounds awesome! I would highly recommend that you cross-post this to the FlightGear mailing list. Ideally though, we really need to work out what is causing these nasty wiki bugs and eliminate them. This is however a very difficult task. It's a rather simple piece of code actually that grew over time - originally it was just a UserScript using Greasemonkey - more recently, it's been ported to the Web Extension framework. I think it is worth noting that this userscript is kinda "infamous", i.e. 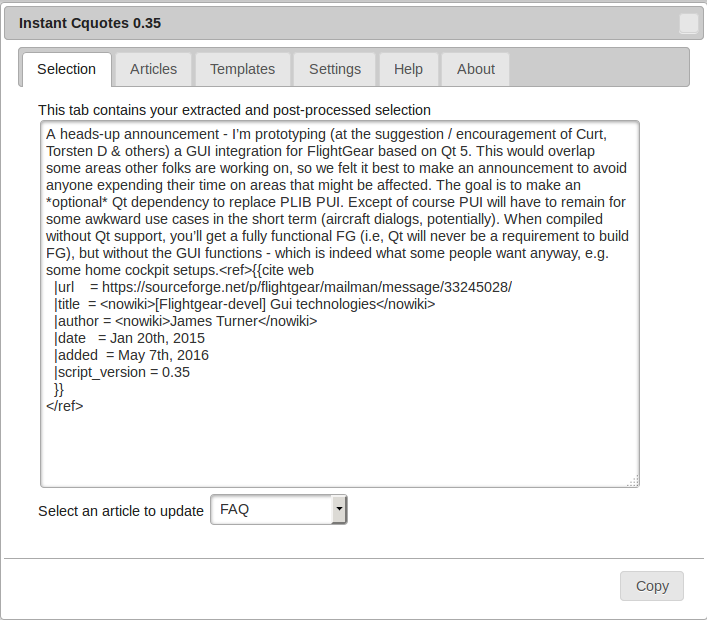 for having the reputation of adding "spam" to the wiki - much of this came from the fact that it was originally using the cquotes template, but after a number of discussions due to excessive "quoting" on the wiki, this got changed to use <ref> only additions, that can be semi-automatically rewritten using 3rd person speech (via a simple regex engine). Meanwhile, the whole thing is no longer using jQuery, so a number of these features are currentlly disabled/not working - but that was mainly so that this could be turned into a web extension. And like I said previously, the addon, and its usage, has a certain reputation for being "obnoxious" - but meanwhile, a number of contributors, including a few core developers, are actively helping maintain articles that were created using this "addon". Obviously, that's really limited to quote-based contributions (which are meanwhile obsolete, all new articles are indeed using refs only). quotes. Hooray's quote system is good for starting an article [1, 2]. break the original logic of the text. Thank you very much for the information! I was not aware about the Instant-Refs tool - I'll definitely take a look. 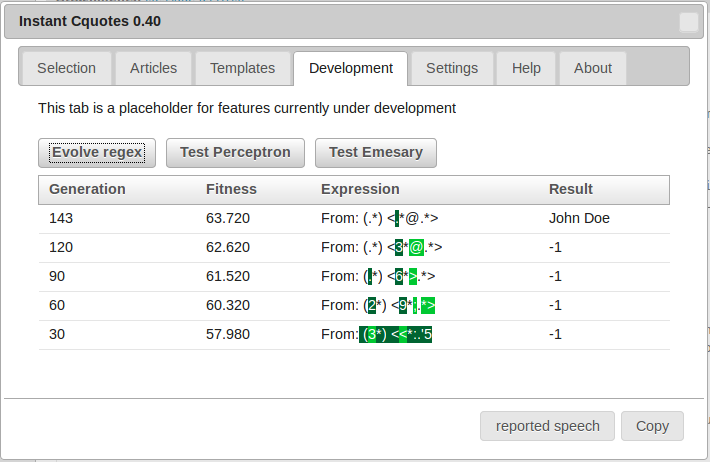 From the documentation it indeed looks like a good place to put the translation helper functionality in. It's a pity that nobody has packaged it yet - I'll see how complex it is I'm familiar with Chrome extension publishing process, but I've never written anything for FF. At this point I plan to do some translations first and then I'll dive into Instant-Refs source. It's not complex at all - it can be packaged via the web-ext tool - running that takes 2 seconds. 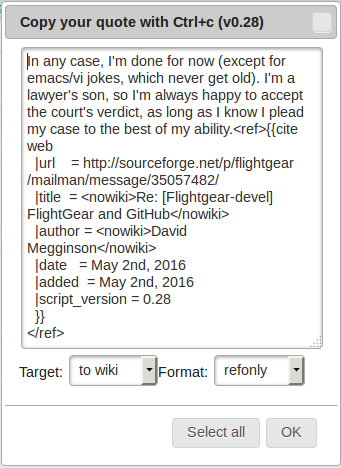 I didn't go through the signing process, because I didn't think the extension would have to be "published" (it is rather specific to the FlightGear/mediawiki use-case right now, but the underlying structure is sufficiently generic so that other front-ends and back-ends can be added at the mere cost of editing 2 hashes). So, it's not exactly rocket science - I guess, it would take only 15 minutes to go through the whole process. Most of your chrome related experience will be applicable 1:1, because the web extension framework is browser-agnostic - i.e. it's the successor to FireFox XUL Addons, so that web extensions indeed also work for chrome, opera etc. Apart from that, the extension is using a simple regex-based engine to do search/replace in order convert forum/devel list announcements to 3rd person speech - something like that could also be used to help bootstrap translations from English to Russian I suppose.